Harleqin: I think that loses a point, because now the point above is sente for White. LukeNine45: I think should be at if you're taking gote in the corner there anyway. Harleqin: is unnecessary, losing a point in gote. Black should first play sente at 257, then 2 points gote at 256. is minus half a point in gote. Note that Black could only play here anyway, but now he gets it in sente. Instead, White should play 2 points gote at the left side (where move 253 went). unkx80: Locally, should be played at White a, Black b, White at . 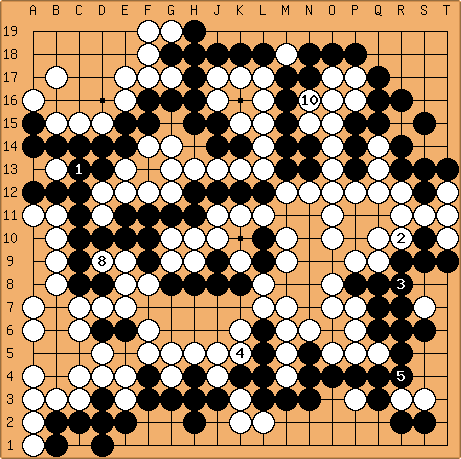 I don't think Black dares to play at c because White d will turn it into a ko. Because after my sequence, Black must connect at d anyway, I will assess the loss of the actual to be 2 points. Harleqin: loses a point, should first exchange for , then hane and connect. The rest are neutral points. Harleqin: and are unnecessary, losing a point each. If you were playing by area scoring, then each pass loses a point for black, too. Dave: I think the first question is whether is sente. If White plays away (e.g. ), what happens after - ? golearner I've calculated the following - let me know how far off I am! Area worth 1/2? How do you calculate the value when it's sente/gote? AREA 5 (line L) - Same situation as AREA 4.
golearner: Okay, I think I see that. (I hadn't realized the trouble Dave's idea causes White in the corner.) It looks like area 1 is the hottest area. golearner: I'm not sure how you're getting the extra points there, unless it's area vs. territory scoring. Harleqin: Nothing like that. 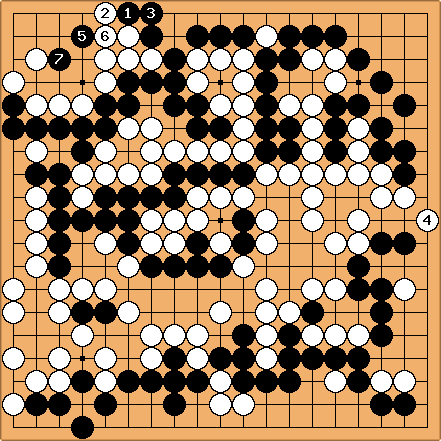 It is just that, if White gets this endgame, Black has to protect again when the outside liberties are filled. Bill: a is technically White's sente, since it threatens Black's huge group. I think it is worth 9 7/9 points, but I'm not exactly sure. The main thing, as Dave and Harleqin show, is that at this point it is double sente. b is a gote that gains 1 1/2 points. If White plays there Black will have to fill at z later, as Dieter points out. Everything else is worth 1 point. c, d, and e are Black sente; f is ambiguous, sort of like White sente; g is a gote that gains 1 point (As unkx80 points out, if Wg Black must later protect around y.). Bill: First, Black takes the double sente, and then takes his sente. Dave: Bill, is sente in this situation? Is it possible for White to pick up a point by playing at a? White is 3 points better for having played a, but and d in sente give Black 2 points back. I am thinking of b and c as miai, but I am not sure whether I am correct overall. Bill: White only gains 1 1/2 points by a gote at a, but gains 2 points by a reverse sente at . However, because of tedomari, I don't think it affects the result. See the alternate play diagrams below. 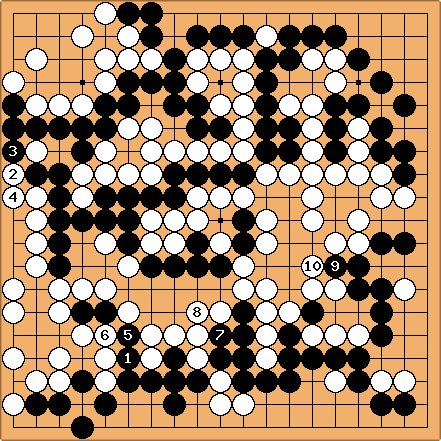 Bill: Next, Black gains 1 1/2 points with - . threatens , a 2 point sente. Black does not respond to , but plays to get the last play with . I think that puts Black 10 points ahead on the board. Bill: White may ignore to take the largest gote with - . Then Black takes his sente. Bill: Your last mistake was 248, which loses 1 point in gote. W246 should have been at 253, but that is unlikely to win. As it was, you gained 8 points against par in this endgame! Thank your lucky stars for that. Bill: Earlier I said that White's atari at was sente. That means that - is gote. Here is a little about responding to . (At this point in the game should be at , OC.) But in this situation I think that is the right response to , to avoid worse. (See Dave's diagram.) Earlier in the game the next diagram is normally correct, I think.